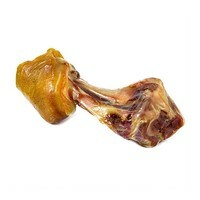 Mediterranean Mega Meaty Ham Bone is a delicious treat for dogs. It is high in protein and low in fat and perfect for keeping teeth and gums healthy by reducing plaque and tartar build up. Please Note: As this product can splinter and break into smaller pieces always ensure your dog is supervised and that water is available. I was really impressed with these bones. Not massive but a good size. My labradoodle made short work of mine over a couple of days but at this price its no big deal. They crumble rather than splinter which is good. Really disappointed that they are out of stock, I hope they get some in soon. Excellent quality bone, there is a little meat left on these bones, which is a bonus. Just as good as the venison bones in my opinion, my Lab loves them.......still chewing away at it.